It’s not even close to a secret that this site has harbored an excessive amount of love for Exploding In Sound, a DIY label that focuses on forward-thinking acts that have roots that run deep in late 80’s and early 90’s alternative punk scenes. Over the years, they’ve amassed a deeply impressive roster of acts that consistently garner critical acclaim, effectively rendering the label one of today’s leading taste-makers in music that frequently aims for left-of-center and connects with conviction. If anyone’s earned an extended weekend celebration that serves a dual purpose as a showcase, it’s Exploding In Sound- and that’s exactly what they’ve just done. Over five days in Brooklyn and Boston, the cities where the vast majority of the label’s acts are based, the label hosted five packed shows. While I wish I could have caught all of them, I only managed to take in the first two- both of which reaffirmed my adoration for the work the label- selflessly run by Dan Goldin- is doing. 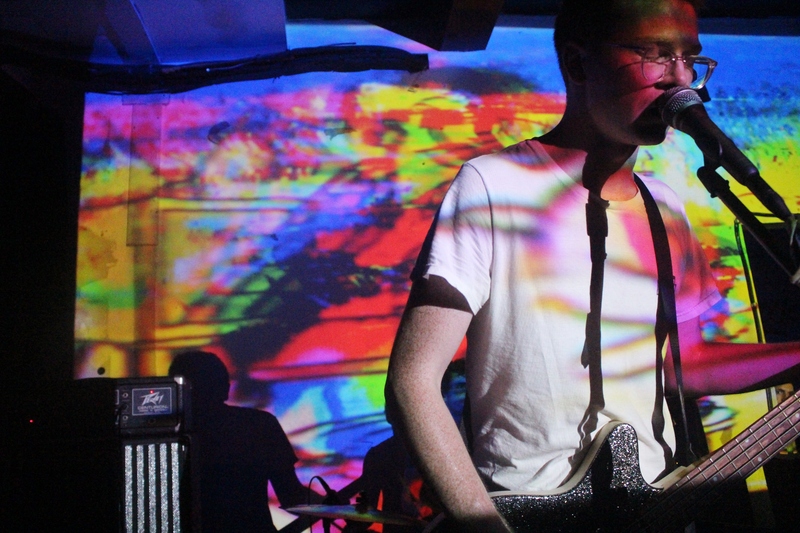 The run of shows started on June 20th at Baby’s All Right with a characteristically stacked lineup that included a variety of site favorites: Washer, Two Inch Astronaut, Grass Is Green, Pile, and Porches. Every single band that took the stage at Baby’s laid their hearts on the line, playing with an unusual vigor that suggested they were doing all they could to make the label proud. That commitment wasn’t the only recurring thread either; nearly every single band played a new song or a song that hadn’t found official release (a trend that would continue to the next night’s showcase at Palisades). Washer got things started with a ferocious set that leaned heavily on new/unreleased material but still allowed “Joe“, one of 2015’s strongest highlight, to close their time out. Two Inch Astronaut followed in a similar manner, almost exclusively playing songs from their forthcoming record (which is being recorded right now) and locking into off-kilter grooves so tightly that their precision was nearly unsettling. Grass Is Green re-emerged after a long dormant period, likely due to guitarist Devin McKnight’s commitment to two other acts affiliated with Exploding In Sound (Philadelphia Collins and Speedy Ortiz) and started slow but worked themselves into a fervor. After finding their strengths in the barbed dynamics and unrelenting guitar attack, the songs went from sounding placated to downright vicious and it was a thrilling transformation to watch unfold. It also set the stage for what was arguably the evening’s main draw: Pile. Last fall, I had the distinct pleasure of seeing Pile in Chicago while they toured on the 7″ that wound up topping this site’s list for the format and, as a result, knew exactly what the band were capable of delivering. Or at least I thought I did, until Pile went ahead and exceeded those expectations. Over the course of what felt like a headlining set, Pile managed to whip the previously gentle crowd into a mad frenzy, with several people in the front having to brace themselves by pushing back on the stage to create a supportive balance. As the band had before- and as it always does on record anyway- “Special Snowflakes” (an easy contender for song of the decade) sent chills running down my spine on more than a few occasions, as did You’re Better Than This highlight “Mr. Fish“. By the time the band was signaled offstage, the majority of the crowd was in a state of rapture. Porches. brought the first night to a graceful close in a hail of light effects, their signature brand of pop (light and sensual), and conviction. All of the songs they teased from their forthcoming record easily ranked among their best work and as they were packing up, the entire room seemed more than a little satisfied. The second night, held at Palisades, felt a little truer to the label’s grimier sensibilities and a DIY ethos was on full display throughout the night. To kick things off, Exploding In Sound presented one of their better coups: Palm. After Palm’s revelatory set at DBTS a few months back, anything less than spectacular would have been a disappointment but the band seemed even more masterful this time around, immediately eliminating any doubts. A live band through and through, they navigated every hairpin shift with an uncanny togetherness that bordered the telepathic. Unsurprisingly, it was a crowd-pleasing start and things only got more intense going forward. Stove, a band born out of the ashes of Ovlov, took the stage next. While the current iteration of Stove features Washer as their rhythm section, the sound (understandably) veers closer to where Ovlov left off. With Steve Hartlett in command once again, the quarter offered up enough riches to constitute a treasure, from the micropop of “Stupider” to the sprawling track contained in the video embed beneath this post’s photo gallery. With several plans for a release (or a handful of releases) in the works, the band played like it was fighting for its life, providing for more than a few moments of genuine exhilaration. Towards the end of the set, Hartlett also ceded the spotlight to Washer, who played one of their songs with the benefit of a dual-guitar attack surrounding them in bass/vocals/drums mode. The set wound up being one of the strongest highlights of either night and all but guaranteed Stove as a name that will be appearing with an alarming regularity in the near future. Hot off of a US tour with Basement in support of an extraordinary 7″, LVL UP took to the stage with an unparalleled hunger and seemed extremely intent on proving their worth. Opening with the live debut of a monstrous behemoth of a new song (again, included in the video embed below the photo gallery) that segued straight into “Ski Vacation” left most of Palisades sold out audience breathless- and likely more than a little speechless. Keeping up a pace that was dangerously close to reckless provided a handful of reminders of why the quartet’s become one of this site’s most celebrated bands. Even putting aside the top ranking that Hoodwink’d earned last year, the band continues to occupy a very niche space in an already niche pocket that directly correlates with what this site was designed to support. All of their best qualities were brought to the forefront on the Palisades stage and by the time everyone’s clothes had grown a shade or two darker in the sweltering heat of the venue, LVL UP had managed the impossible and endeared themselves even further to an already adoring crowd. After a set that felt genuinely huge despite a mid-bill placing, it would be tough for most acts to follow up with anything worth remembering- but most acts aren’t Big Ups (a band whose shirts were being proudly worn by a few members of the bands playing the show). Of the 10 bands that played the first two nights, this was the one I was most excited to see, having never previously caught a set in person despite praising their live show a number of times via Watch This. Animalistic in nature and deeply impassioned in the throes of execution, Big Ups’ live show is nothing short of incendiary. Pair it with an obscenely strong discography that includes Eighteen Hours of Static, one of 2014’s finest releases, and the band’s a veritable Molotov cocktail. Tension and release, whisper and explosion, the band balances volatile dichotomies with ease and constantly hits their mark. A magnetic live presence carries them to the pantheon of today’s greatest live acts with ease and their set was a perfect example of how much they’re able to coax out of decidedly minimal trappings. By the time the quartet was letting their final bursts of feedback draw back to silence, they’d comfortably delivered another powerhouse set that would put most other bands to shame. With all four bands racketing up the evening’s consistency level, a lot of pressure can fall on a headlining act. Then again, Exploding In Sound’s resources are surprisingly vast and its talent pool runs extraordinarily deep. Those resources and that talent pool also include Krill, who have steadily amassed a cult following and are enjoying a period of heightened interest and universal acclaim following their excellent A Distant Fist Unclenching. The trio had been in excellent form on both occasions I was fortunate enough to catch one of their shows earlier on in the year but something about this particular set felt different. The band’s been slowly working on new material as some of the members move from Boston to NYC and they used the occasion to showcase some of what they’ve been shaping while making sure to make enough space for recent career highlights like “Torturer” (their opener), “Brain Problem“, and “Tiger” (their closer). At one point, for a brief run of song, bassist/vocalist Jonah Furman swapped out his bass for a guitar (one that was immediately put through a rigorous effects setup) to add a new depth and several more layers of dimension to the band’s already impressive dynamic approach. In all, the set played like a greatest hits victory lap, with the band playing in a manner that felt deeply impassioned and incredibly alive. A triumph from start to finish, the band went above and beyond exceedingly high expectations to guarantee everyone that their headliner placement was the correct call. Ten great bands, two great venues, and one incredible label all came together over the course of two days to create and support something that felt inherently special, something bigger than any one of its individual parts. A sense of camaraderie was constantly present, musicians from other internationally acclaimed bands drove several hours to see some of these shows and all of the most uplifting, prevalent themes seem to have carried all the way through the five-day weekend. While I can’t definitively speak to the final three nights, the first two reinforced every aspect of what makes Exploding In Sound such an incredible cultural institution. On top of all that, these first two nights felt like so much more than a night out with good friends listening to great music; this was something that had historical value. As is always the case with any of Exploding In Sound’s projects, it was an honor and a privilege to watch it in motion. View a photo gallery of the show here and a video containing performances from each of the bands that played at Palisades. Enjoy.